If your business provides animal-assisted growth and development, then you have an unusual and moderately high liability exposure that is not covered by many insurance companies. Here at Ark Agency, we can provide you with the coverage you need to keep your business protected. We offer a variety of animal life insurance policies along with liability. There are two categories of animal-assisted services, and we have provided details below on both. 1. The Insured provides non-riding “light” animal therapy to patients in hospitals, and residents in nursing homes, children’s homes, schools, hospitals, assisted living facilities, and those with special needs living in private homes. 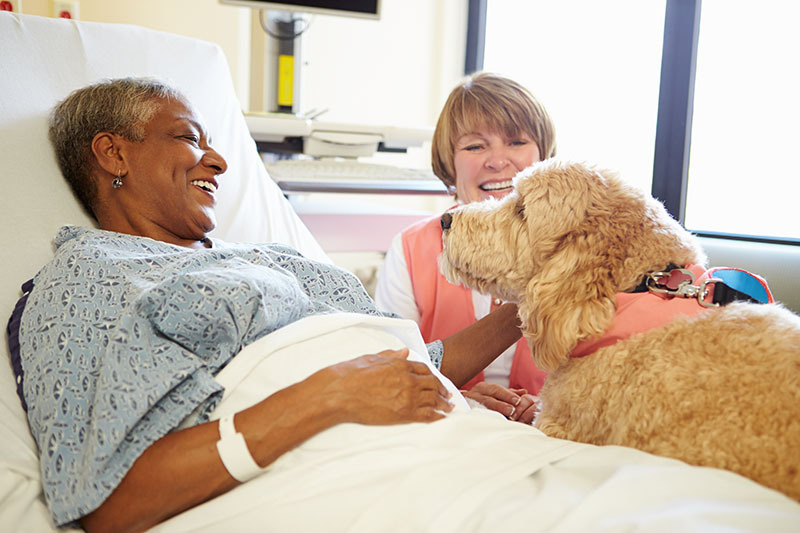 The service involves controlled, supervised observation, interaction, and touching of smaller docile animals such as service dogs, cats, rabbits, miniature horses or burrows by patients and residents whose lives can often be brightened by the experience of touching and interacting with an animal. Some providers deliver this service without any pay because they volunteer, but others are paid or compensated in some way for the services under a contract. 2. The Insured offers a fee service of providing animals for and assisting a professional physical therapist, psychologist, or psychiatrist with therapy for people who may or may not be physically or mentally challenged. Animals have been used since about 1997 to help people to improve their emotional, behavioral, and communication problems by mental health professionals. Success may be achieved when troubled people can observe problem-solving abilities in animals. Therapies involve the patient just watching or observing the animal’s behavior and problem-solving reactions to “set-up” circumstances. This may not involve touching of the animal, and these animals may not have a high degree of training. The Insured should be trained and certified to provide the animal handling services for a therapy session. An unusual factor of this activity is that sometimes the Insured is also a licensed professional therapist who is providing the animal and handling services to other therapists. At other times that same Insured may provide the animal and handling service in addition to providing therapy to the patient at the same time. Professional malpractice insurance policies do not cover the GL exposure of providing the animal and handling as a service, so it is this coverage that we are providing. The attending professional therapist should hold a degree in his or her area of expertise and carry a professional liability insurance (malpractice) policy in their name, a coverage that is not written under this program. The Insured may have a Professional Liability exposure in addition to that for General Liability. Professional Liability can be added to the general liability policy by endorsement for each professional animal handler, and there is a separate premium charge for this important coverage. Animal (and Equine) Assisted programs have existed since about 1996. Today animals and their handlers are ususally screened, trained and certified for this purpose. Some organizations and colleges provide courses, certification, and degrees in Equine and Animal Assisted services. Some organizations may require animals to recertify several times year, as their attitudes toward the work can change. Criteria are strict. Underwriters will review the purpose of the work, training, experience and credentials of the animal handler, the animal species and their ages, experience and training. Some animals and animal species may not qualify for coverage. Also considered are the types of people and facilities served, how animals are transported, how the contact experience is supervised or carried out, if it is done under a contract to a facility, and the number of people present for sessions. Underwriters will also want to see a safety and emergency procedure plan should a handler encounter a problem, or not be able to complete a session. The insured should have identified the most possible-to-occur emergency situations that could arise and develop a mitigation plan for each. As an Animal Assisted Services provider, you worry that you may be sued or otherwise have a claim made against you for bodily injury or property damage by a client or someone else who comes in contact with you or the property that is part of your operations. If sued, you will need to hire a lawyer to defend you and you wonder how you would go about doing this. If found negligent or responsible, you would likely have to pay a court-ordered or agreed-upon settlement to the injured party. Fortunately, much concern can be relieved when you buy a Commercial General Liability Policy [GL] to insure this activity. Commercial General Liability Insurance protects you from financial loss should a patient, student, resident, visitor, or a trespasser become injured [Bodily Injury] or their property is damaged [Property Damage] in relation to your operations, and they make a claim or file a lawsuit against you for damages. How Risky are Animal Assisted Growth & Development Services? Moderate. Even though well trained, an animal is still somewhat unpredictable. People are as well, and sometimes do things that threaten an animal and cause them to react to protect themselves. The biggest concern is the potential for bodily injury to patients, residents, assistants, and bystanders. Animal bites and scratches would be a common concern, and bites can be severe if they happen. A larger animal could step on or bump and bruise someone. An animal may scare a person and cause them to fall, or actually knock one down. However, the careful choice, certification, and experience of animals, and the experience and training of handlers modify the exposure. Careful supervision of an animal visit with a client also assists to moderate the exposure. 1. A handler losing control of an animal, whereby it injures a patient or other person it comes in contact with. 2. A patient suffers additional or aggravated injury in relation to the condition for which they are seeking therapy. 3. A patient becomes frightened about the animal and falls, or the animal knocks them to the ground. 4. A larger animal steps on or bumps and bruises someone whose condition may be fragile. These types of businesses use a variety of animals from dogs to horses, which is why we carry equine and livestock insurance to ensure you are protected. Everyone have unique insurance needs and our team is ready to help determine the best coverage for your business. Dial 1-800-328-8894 to discover the different types of horse insurance we offer.